They’ve threatened to put him in the woods! For Brother Ealdred’s full reply, read The Saxon Times. Statements made in The Saxon Times, regarding the advice on herbal and natural remedies, are sourced from the ‘Lacnunga’, a collection of miscellaneous Anglo-Saxon medical texts and prayers. The advice given by Brother Ealdred is for information purposes only, it is not meant to be a substitute for medical advice or diagnosis provided by your doctor or other medical professionals. Do not use Brother Ealdred’s advice to diagnose, treat or cure any illness or health condition. If you have, or suspect that you have a medical problem, contact your doctor or health care provider. By March, the ‘Treacherous Tostig’ had sailed all that way to Denmark and on to Viborg, just for King Sweyn to tell him no. It’s an interesting viewpoint and one that makes some sense but will King Harold take heed? After spring begins, William summons another war council to meet at Lillebonne and they begin to draw up the invasion plans. FitzOsbern, Lord of Breteuil, announced that “I’ll furnish forty ships, manned, equipped and provisioned, who of you will be brave enough to follow my lead”. The gauntlet was thrown down to the assembled nobles, challenging their loyalty to great effect. The first battle was won. Resources are available through TES Resources and by mail order from History Walks. In writing The Saxon Times some fun stuff was added too; adverts, medical pages, cooking pages and a few insights from the ‘people’. Events such as the report by the BBC that the ‘Battle of Hastings sword failed to sell at auction’ and ‘the discovery at Lewes of the skeletal remains of a man believed to have been injured at the battle’ are all be woven into the fabric of the paper. 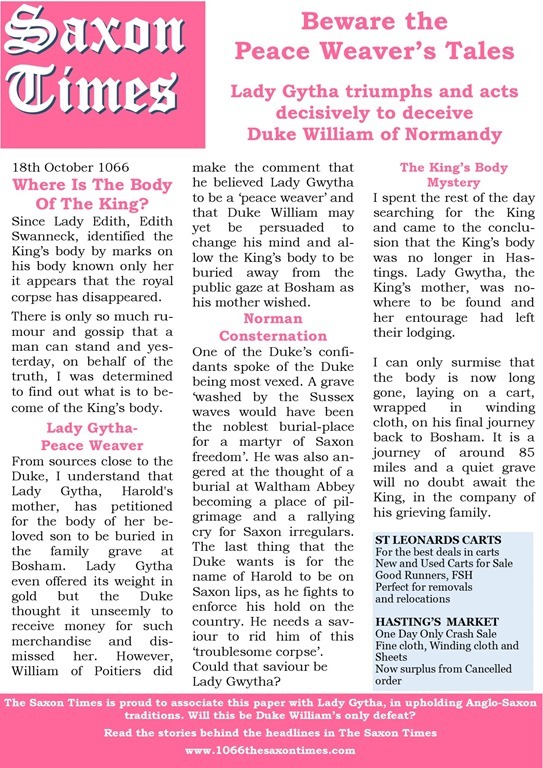 The use of a newspaper style to record historic events allows a more introspective view of the circumstances and, together with ‘expert’ comments, enables a more inclusive look at 1066. The Saxon Times forms an important link in the history of 1066 for KS3. The newspaper is look at how the events of 1066 may have been reported and records ‘eye-witness’ reports of the events surrounding the death of Edward the Confessor, the coronation of King Harold II, the events led to the Battle of Hastings, 14th October 1066 and the subsequent conquest of England through the eyes of The Saxon Times reporters. The Saxon Times addresses key skills in interpretation, evaluation and explanation of the changes that occurred in 1066 Anglo-Saxon England. 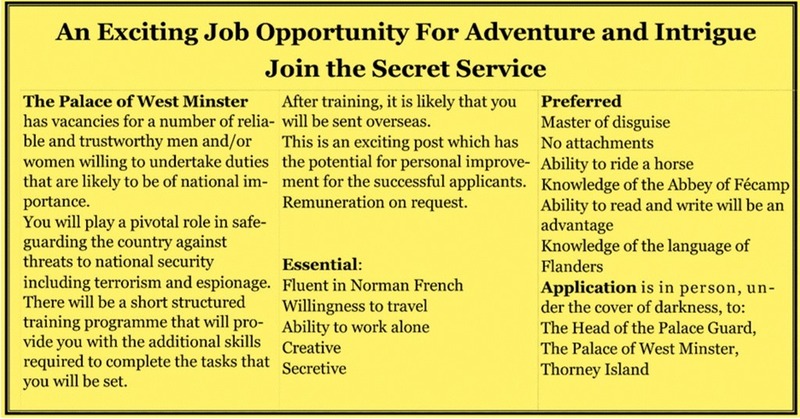 Imagine life as a Norman or Anglo-Saxon, a noble, a soldier or a peasant. Who were the claimants to the English Throne? Why did Duke William take the long route to London? Why did Duke William need the blessing of the Pope? What was the timeline for the Battle of Hastings? What was the timeline for Duke William’s advance on London? 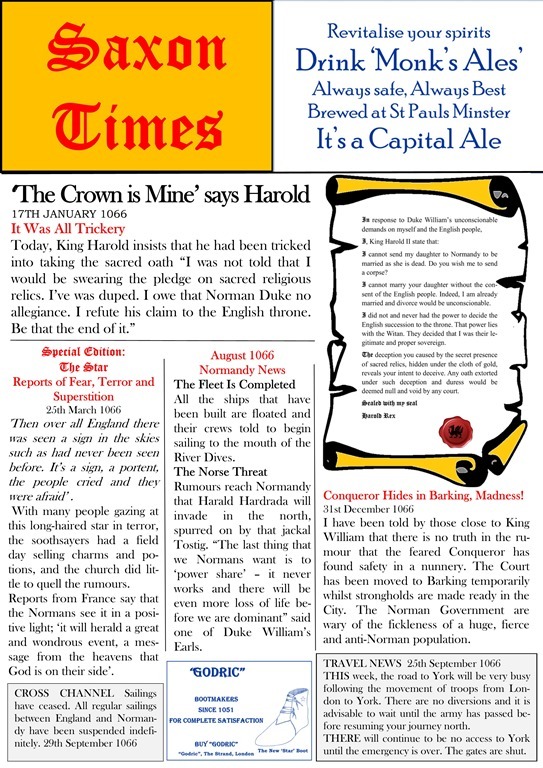 The Saxon Times is available in individual editions, for wall display and classroom handouts, and each issue is a brief summary of the day’s Saxon Times news from 1066 as it happened with editorial, comment, features, foreign news, and special editions to bring the events to life. The Saxon Times is also available as an A4 size paperback, published by Bretwalda Books, with the full stories behind the headlines for the whole year.